I have a slight blind spot when it comes to Lavazza. I know that they claim to be “Italy’s favourite coffee”, but unfortunately I’ve mostly seen their name outside pubs. Now I love pubs, but if there’s one thing that no pub ever seems capable of doing, it’s brewing a decent cup of coffee – given this near-universal failure, I suspect it’s more to do with the pubs than the beans. So, how does Lavazza turn out in the hands of a less disinterested barista?! The grounds have a dark cherry fruit aroma, and the old wood smell of fallen logs as well as a hint of cigarette smoke underneath. Brewed, the fruit is lost and the wood aroma becomes more reminiscent of an old furniture shop. 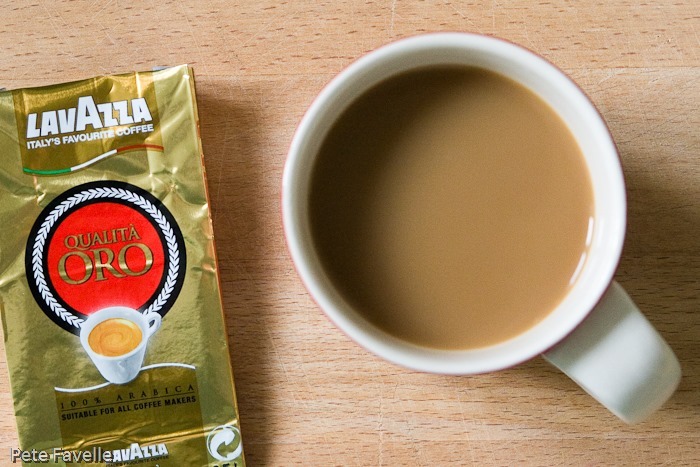 There’s a richness to the smell, along with a distinctly bitter edge – it is, to be fair, a very Italian coffee nose! It has a generous body, but the actual flavour is somewhat lacking – a suggestion of dark fruit, very little sweetness but quite a serious bitterness in the background. It’s drinkable, but it doesn’t have the depth of flavour that I’d like to balance the bitterness – 2 stars. Many thanks to Lavazza for this sample.